Brennan Dunn, founder of DoubleYourFreelancing.com, has built a business teaching freelancers how to charge what they are worth. Brennan has long been an advocate of building out an email list and using that list to develop a relationship with the readers, hopefully turning them into customers along the way. His email funnel is a well-oiled machine that reliably turns readers into revenue by moving customers along a purchasing path that presents them with products at a increasing price point. In 2014, he more than doubled the size of his list and used that to sell almost $300,000 worth of DoubleYourFreelancing products. Not bad at all! With such a highly optimized funnel, there may seem like little room for growth. But after carefully considering how each part of his funnel work together, I found three areas that could give his machine some extra horse power. 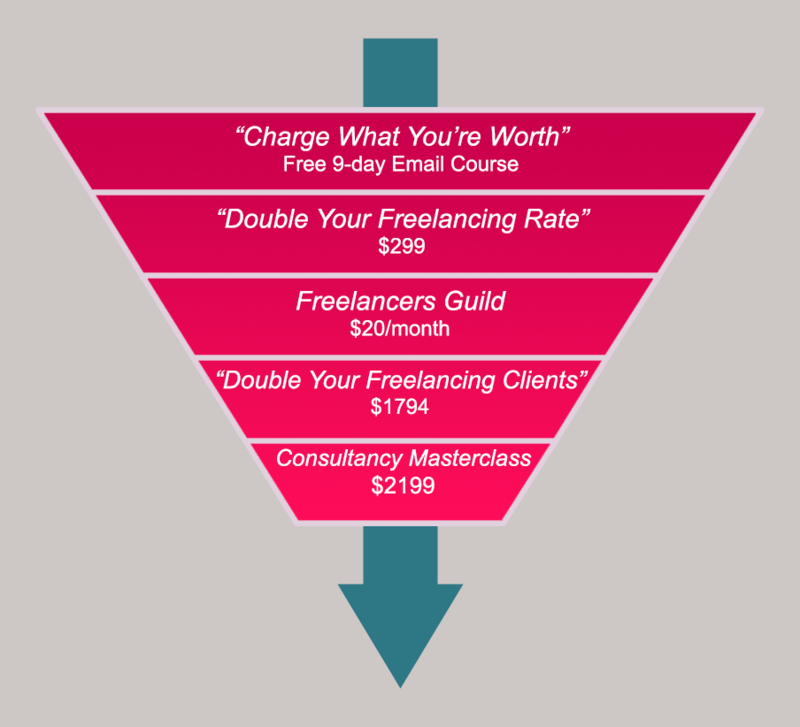 Double Your Freelancing Clients [DYFC] started out as a follow-up book to Double Your Freelancing Rate [DYFR], but Brennan redid the course and turned it into something much bigger. Instead of just being a framework for generating leads, he extended it to cover every available channel for getting clients. He also added a live class component that provides one-on-one mentoring, office hours, and a community of peers working towards the same goal. The class is only offered once a year which makes it crucial he has a process in place to keep his readers interested enough to stick around for the next course. Different people are willing to spend different amounts of money to solve a problem and this willingness can be approximated using a power-law graph. If somebody’s toilet won’t stop running they may watch a free YouTube video to explain how to fix it, others will call a plumber, and some will just buy a new toilet. Even if it seems crazy, some people will spend an inordinate amount of money to solve their problem. This is why savvy marketers create solutions that let the customer spend as much money as they want. Brennan gets this and it is why his funnel has several tiers with different price points, but he is likely missing out on an even higher tier by not increasing the price of his in person workshop and creating a process to promote it. In 2014, he grew his list by 18,000 people and sold DYFR to almost 1500 of them at an average price of $136.60. Plotting this out with help from Perry Marshall's power curve tool, we can assume that at least 10 people are willing to spend $10,000 learning from him how to improve their freelancing careers. But they can't. His list is growing at 100 opt-ins a day, and he wants to get that up to 500. He successfully launched his new DYFC live class with nearly a $2000 price point, but after students successfully complete that course there will be a small percent of people who want to spend a large amount of money learning more. Brennan should work on building out his premium offering so that those clients can spend that money with him. Note: In DYFR, Brennan mentions offering $2,000/mo coaching, but looking over his annual income reports I couldn't find a mention of it, so I am not sure if it is new or something he no longer does. Either way, that is the right idea. While I love building email funnels, Brennan is a true master of that, so I can’t help him with these first two areas. Where I can help him is by showing him how to use paid advertising to get more people into the funnel so that he can work his auto-responder magic. Facebook is perfect for Brennan’s product. His product is unique. If your product is a commodity that can easily be bought elsewhere, you are going to struggle with Facebook ads. He is selling to individuals. Targeting large companies can be hard because many employees try to separate their personal life from their work life. For freelancers, they are their business. Their work is a big part of their life which makes it easier to connect with them on the subject. He already has a highly optimized funnel. Most of the “Facebook Ads Are Dead” posts are written by people who stick up an ad and just point it straight to a sales page. You need to nurture your Facebook leads in order to turn a profit. Before doing anything else, I would setup and install retargeting pixels site wide, and for every individual section. This is a core part of the strategy, and later you will see why it matters so much. Brennan already has an email list of over 26,000 people, so he is way ahead of where most people are when looking into paid advertising. It may not be obvious why his email list matters when trying a new channel, but Facebook has a powerful feature that gives Brennan a huge head start when building his audience. With custom audiences, you are able to upload a list of email addresses or phone numbers and have Facebook search through their database, matching up as many of those as they can with real users that you can target with ads. Depending on the quality of your list, you can expect to get a 30-70% match rate. For Brennan, that means he will be able to reach out to between 8,000 and 18,000 people who have already expressed interest in his products, right out of the gate. After importing his email list, I want to get those subscribers to engage with his Facebook page so he can start building an audience there. How do we do that? Page likes. I know, I know. It’s popular on the blogs to bash trying to get likes, and while a lot of that hate is warranted, they do have value for a specific reason. I will start by saying that you should never pay shady services for likes, because it creates a large audience that doesn’t engage with your posts [they aren’t real people]. This is bad because engagement is a major metric Facebook uses to determine how many people see your posts. The lower your engagement metrics, the smaller the share of your audience that will be exposed to your content for free. Brennan has a list of 26,000 people that have said they want to hear what he says. He could target them using the custom audience feature whenever he wanted to contact them, but that costs money. If he can get those fans to like his Facebook page, he can then reach them for free. So the first priority is to rebuild that community on Facebook. A lookalike audience is where Facebook takes any custom audience you feed it and builds a new, completely unique list of users that have similar likes, interests, and behaviors. When creating it, Facebook gives you two options for how they will construct the audience; similarity or greater reach. The more targeted your list the better, so go with similarity. To increase the targeting even further, I would then add “self-employed” as an additional layer under “Behavior”->”Job Type.” This would target only people who are within the lookalike audience AND identify as being self-employed. Exactly the people who would be most interested in his products. Targeting is a huge piece of the Facebook puzzle, so you never want to take anything for granted. That’s why it is important to always test other targeting layers to see how they perform, like “freelancer” instead of self-employed, or targeting interests like "Wordpress" or "Graphic Design." Once I have this targeted group of people, I want to pull them into a loop that works to move them to his email list where the real selling begins. The first step is to create an article or guide on a subject that he knows resonates with his readers. Something like his Definitive Guide to Getting Paid As A Freelancer would be perfect. This is where the retargeting pixels come in. When a user clicks through to the content, we still can market to them whether or not they opt-in to the mailing list. Brennan gets around 10% of his website traffic to opt-in [which is awesome, by the way], but that still wastes 90% of his traffic. With Facebook, that traffic doesn’t have to go to waste. At this point, they are already familiar with Brennan so he can start moving them further down the path toward his email list. Repeat this loop a few times with different offers and you will have a much, much larger share of opt-ins from your traffic than the original 10%. This works for the same reason email marketing works; slowly build a relationship with your reader by consistently giving them value and over time they become more willing to engage deeper with you. Think of this as a very low touch nurturing campaign to get people comfortable enough to give you their email address. The best part is this happens automatically. It is like a series of conveyor belts moving people towards the purchase, and Facebook gives us a reliable source of fuel to keep it running. 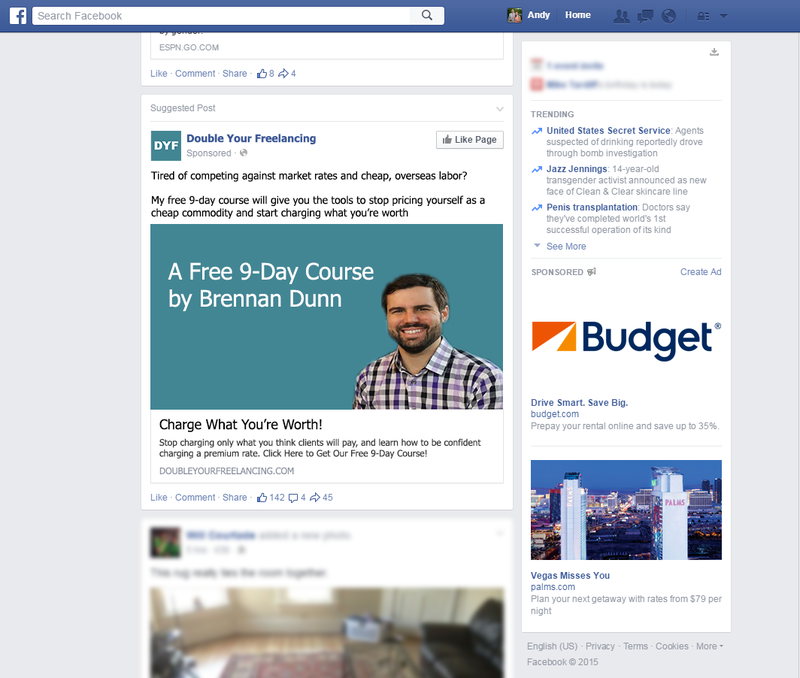 Now are you seeing the power of the Facebook ads and the retargeting pixel? How else could Facebook Ads improve Brennan’s bottom line? The main area to focus on is moving customers further down the funnel. Just like I would retarget those that didn’t opt-in, I would also target those who signed up for the list but didn’t purchase. Like I said, Brennan’s email funnel is about as solid as it gets, but for some prospects, that isn’t enough to get them to bust out their credit card. Brennan has thousands of customers who he has helped succeed in dozens of industries. Retargeting non-buyers with testimonials from these successes would have a huge ROI. He already collects case studies of successful customers with his Student Success Spotlight series, but I would suggest he experiments with video testimonials. Video ads stand out on Facebook and get great engagement, even if that video isn’t shot with a high quality camera. Ramit Sethi, another author in a similar space and master of email marketing, extensively uses video testimonials to crush any objections that buyers may have. He has found that testimonials are so valuable, he now has two employees whose only job is to collect and organize them. For his flagship course, Earn1K, he has a 15-page PDF documenting over 100 of written testimonials, and also features highly produced video testimonials right before asking for the sale. Brennan knows what makes his customers tick. He should also try taking the biggest objections people have, find the content straight from the actual course that answers those objections, and use that in an ad. When looked at in terms of the overall marketing picture, Facebook is a great tool to augment other parts of your funnel and help guide your prospects to the purchase. Using email alone can clearly drive awesome results, but when combined with a retargeting tool like the one found in Facebook, the results can be transformative to a business. With a solid email funnel in place to nurture and sell your leads, you can open the Facebook floodgates and let the traffic pour in, knowing you will be able to monetize it. But without a strong email funnel in place, it is going to be very difficult to make Facebook advertising work. People go to Facebook to avoid making decisions. They aren’t thinking about your products and services, so to turn them into buyers you need a system to nurture these prospects. If you are just starting to look into paid traffic, I would strongly suggest first making sure you have the basics down for your email marketing. Need help getting started with email? I offer a free 2-week course on using email to convert browsers to buyers which will give you a great head start. If you have the funnel in place, then I strongly recommend looking deeper into Facebook advertising as it is like steroids for your email marketing. A great book on the subject, written by Google Adwords expert Perry Marshall, The Ultimate Guide to Facebook Advertising: Second Edition. I can’t recommend it enough.